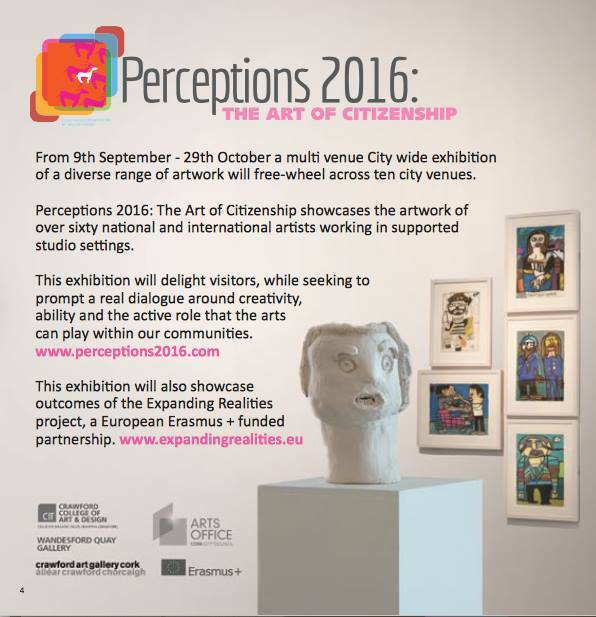 Cúig artists are excited to be exhibiting at ‘Perceptions 2016’ a city wide event showcasing the work of over 60 international artists working in supported studio settings. The event will run in a number of venues across Cork city including Crawford Gallery, Wandesford Gallery and City Hall from Sep 15th until Oct 29th. The exhibition aims to encourage dialogue around creativity, ability and the active role that the arts can play within our community. Cúig will also be involved in a series of creative workshops with the public at Wandesford Gallery each Friday morning from 16th Sep until Oct 21st 10am -1pm and a series of ‘Meet the Artist’ sessions at Crawford Gallery. 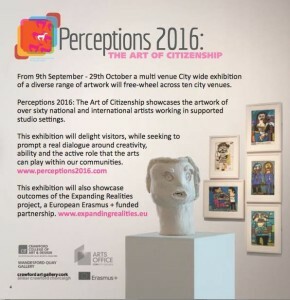 As part of Cork Culture night, ‘Perceptions 2016’ venues will be opened to the public throughout the city and Cúig will be facilitating face to face portraits with the public at Cork City Hall. ‘Open Door’ Exhibition and Culture Night!